Delicious little shortbread biscuits. The translation…Ladies Kisses.The original recipe is from Piemont – northern Italy.Known for it’s hazelnuts. Two round hazelnut – almond shortbread biscuits joining by a kiss of chocolate in the centre. 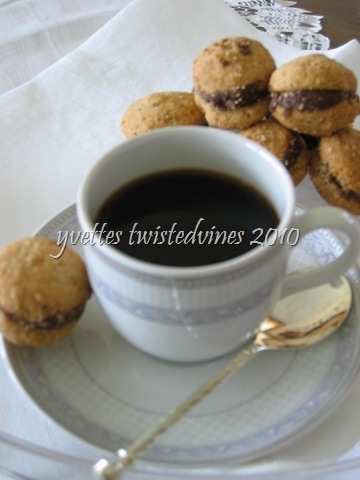 These special biscuits are just divine finishing off the evening with an espresso, or liqueur. Have you tried these? Have you made them? They’re crunchy mouth-watering bite size biscuits…Baci di Dama. Have a great coffee break! perfect size to pop…oh about 10 in my mouth as I have a little espresso. Very dainty!